Benefits :- Vajra bhasma is having debridement power, and other medicine serve as a homeostatic agent together controll the uncontrolled mitosis of cancer cells and in addition maintains body strength and immunity therefore useful in all types of cancers. Also it has nourishing action on neurons, heart cells, therefore useful in heart diseases, neuronal disease viz. paralysis, sciatica etc. Also useful in disease of eye, genitourinary tract & respiratory tract. Very useful in male infertilityand maintains physical & mental strength in old age. Direction For Use :- ½ to 1 tab. morning empty stomach with ghee/milk cream/butter/honey ( Dose depends upon age, weight & illness of the individuals).OR as directed by physician. 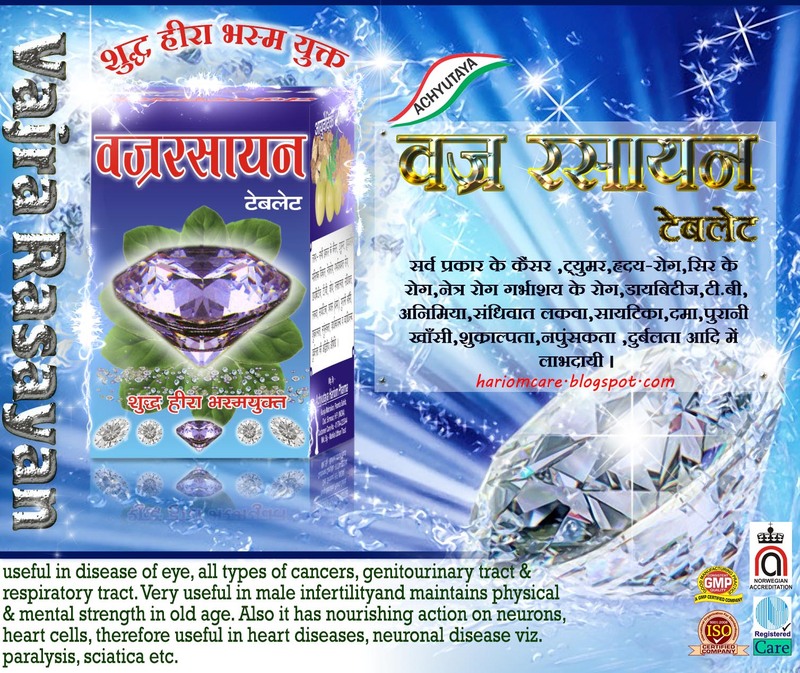 Main Ingredients :- Vajra Bhasma & other medicine.